Like rhythmic sounds? 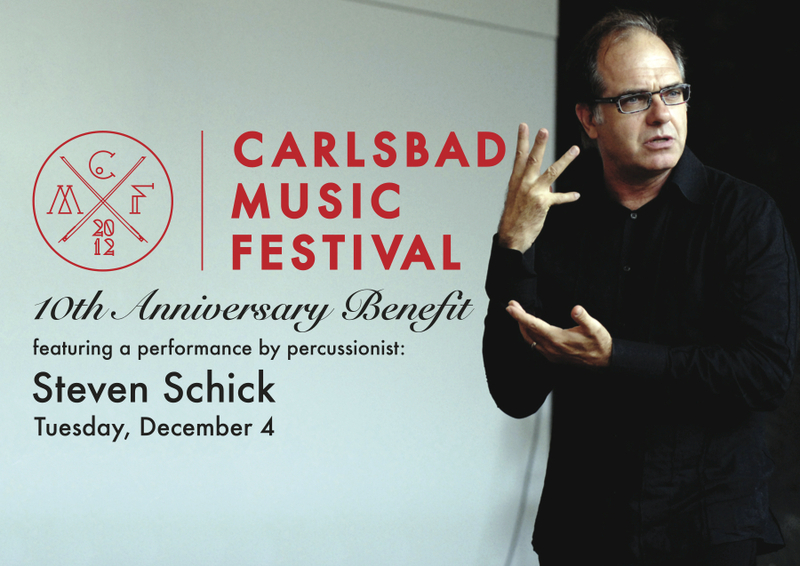 Then the 10th Annual Benefit for the Carlsbad Music Festival might just be the perfect thing for you. Percussionist Steve Schick will be performing in the St. Michael’s by the Sea Chapel on Tuesday, December 4, 2012 at 6:30 PM. Schick is Distinguished Professor of Music at the University of California, San Diego and a Consulting Artist in Percussion at the Manhattan School of Music. He was the percussionist of the Bang on a Can All-Stars of New York City from 1992-2002, and from 2000 to 2004 served as Artistic Director of the Centre International de Percussion de Genève in Geneva, Switzerland. Schick is founder and Artistic Director of the percussion group, “red fish blue fish,” and in 2007 assumed the post of Music Director and conductor of the La Jolla Symphony and Chorus. Ticket for the performance cost $100 and can be purchased online right here. Following the performance there will be a reception at the Beach Terrace Inn. St. Michael’s by the Sea is located at 2775 Carlsbad Blvd. in Carlsbad. 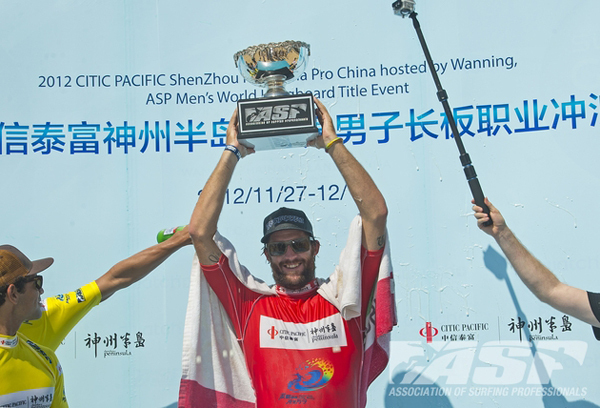 Carlsbad surfer Taylor Jensen, 28, won his “second consecutive ASP World Longboard surfing title, defeating Hawaiian veteran Ned Snow, 30, to secure the CITIC PACIFIC ShenZhou Peninsula Pro hosted by Wanning in China today, November 29, 2012. Jensen had to fight through the flu, but the sickness didn’t stop him apparently. 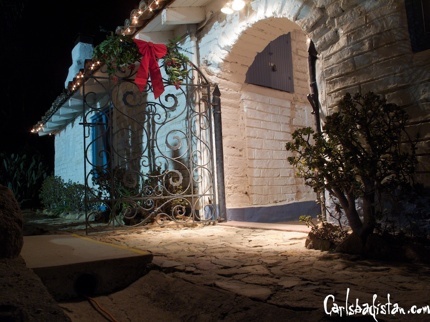 On December 1, 2012 celebrate the beginning of the holidays with the City of Carlsbad’s Annual Holiday at the Rancho celebration at Leo Carrillo Ranch Historic State Park. Purchasing a Hilton Carlsbad Oceanfront Resort & Spa “Preferred Neighbor Card” from the Carlsbad Education Foundation brings discounts on nearly everything at the resort and helps raise money for Carlsbad Schools. When No Child Left Behind was signed into law in 2002 it was supposed to produce 100 percent grade level proficiency in English and math for all students by 2014. But to this date only 59 percent of California 5th graders have reached proficiency in English, only 63 percent in math. By comparison, 79 percent of Carlsbad’s 5th graders are proficient in English and 80 percent in math. Oh, we love trash! Anything dirty or dingy or dusty Anything ragged or rotten or rusty. . . and it appears we’re not the only ones. The City of Carlsbad has planted six different styles of garbage cans in the Village of Carlsbad this week and they what your help deciding which style of trash receptacle you’d most like to see around town. 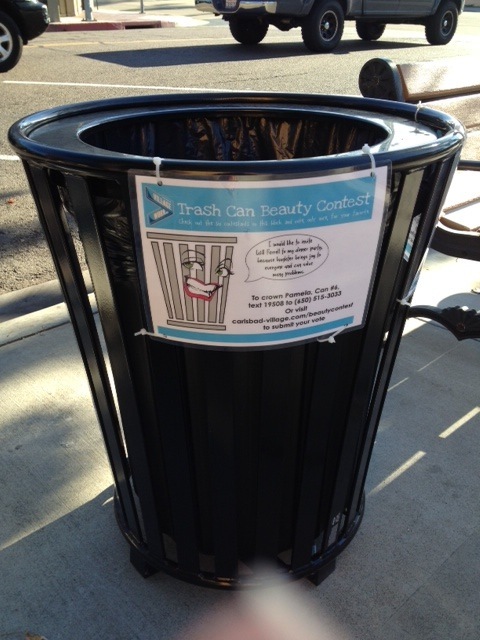 The trash receptacles are all located on State St. between Carlsbad Village Dr. and Grand Ave., with one by the fountain at State and Grand. Voting is open until November 30. . . The cans were either donated or loaned by various street furniture manufacturers. The goal of the contest is to determine which cans the public likes best and which perform the best — and ultimately to upgrade the existing receptacles throughout the Village. 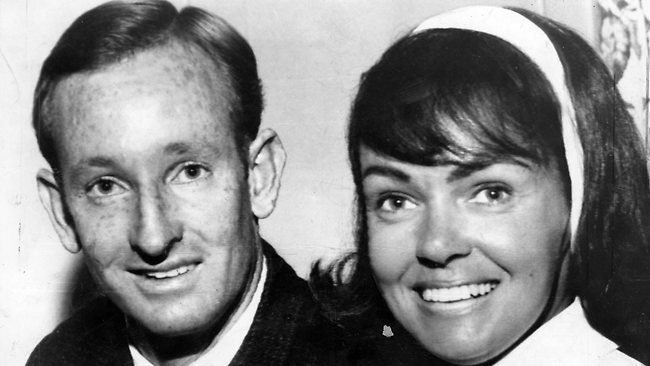 Mary Laver, the wife of tennis legend Rod Laver, died Monday, November 12, 2012 in their home in Carlsbad, according to a story on News.com.au. She was 84. Our thoughts are with the entire Laver family. A woman who was late returning to work from an afternoon break today (November 9, 2012) was reportedly discovered dead in her car by her employer, according to witnesses. 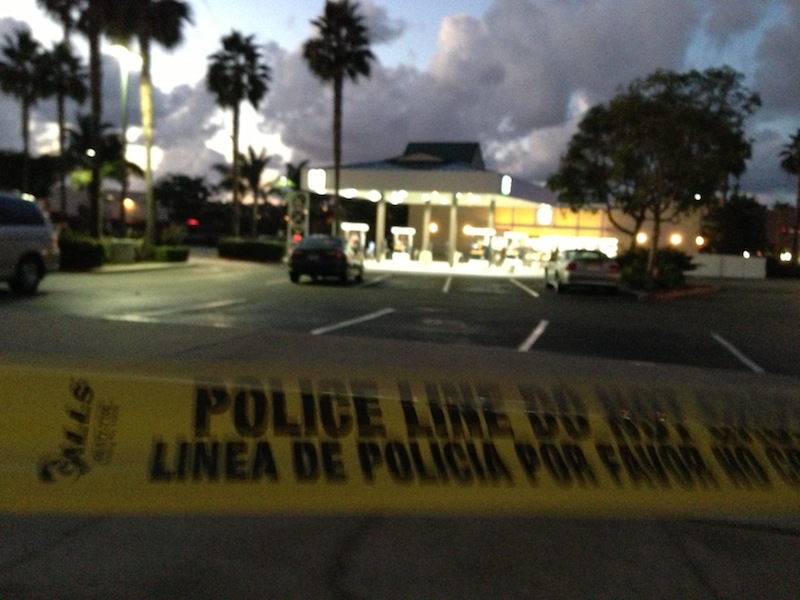 The car was parked in the Southwest corner of The Island @ Carlsbad Shopping Center near Faraday and College just off Van Allen Way. The woman had apparently been stabbed. At 5 PM the entire Island @ Carlsbad parking lot including Van Allen Way south of Faraday was closed and the Carlsbad Police Department Crime Investigation unit was on the scene. The investigation is on going. [Editors’ Update November 10, 2012: According to a story on NBC San Diego here are the details. The woman who died was a dental assistant named JoAnne Javier, 24. Her boyfriend, John Monta, 28, (right) of Linda Vista (and father of Javier’s three-year-old child) was arrested shortly before 10 PM on Friday in Linda Vista. After an hour-long stand-off, officers were able to coax Monta out of the home and he was taken into custody on suspicion of Javier’s murder. 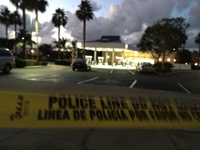 . . Monta’s father told NBC 7 that the suspect is dying from lymphoma and had just undergone a bone marrow transfusion. When Monta surrendered to police, he exited his Linda Vista home carrying a medical bag in his hand. You could hear a collective sigh of relief in school district offices throughout California after voters approved Prop 30 on Tuesday. Not that happy days are here again for school funding. The Carlsbad school district has already cut costs by $6.1 million this year. Teachers, managers and other school workers pitched in with $2 million of that amount in pay cuts. If Prop 30 had failed to pass, another $4.8 million would have been slashed from city schools, amounting to a hit of nearly $11 million in a single year. But the best news from Tuesday’s election results is that the air is beginning to leak from the anti-tax Tea Party balloon. 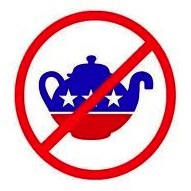 Maybe it’s the irony voters are beginning to see in the public’s eagerness to contribute millions to political campaigns to support candidates who pledge not to raise their taxes by a dime and who hate government so much they’ll say or do anything to win a seat in it. The AM PM Arco gas station at 1991 Palomar Airport Rd. (at the intersection with Camino Vida Roble was robbed at gun point in the early hours of November 7, 2012 according to the Carlsbad Police Department. Officer Seapker contacted the victim who stated a white male adult entered the store and pointed a gun to his head. The suspect demanded money. The clerk gave the suspect and undisclosed amount of money and the suspect fled the scene on foot. Several Officers and a K-9 checked the area for the suspect but were unable to locate him. The investigation is ongoing. If you know a thin white, blonde, gun-toting 25 – 30 year old male 5’7″ tall who suddenly came into a little money, give the Carlsbad Police Department’s Sergeant Chase a call at 760-931-2136.